Its finally Fall here in Birmingham Michigan, and some of our customers have been calling because they have these strange looking bugs in their homes. It has been turning out that they have Stink Bugs!!!! What is a STINK BUG you ask? Well let me give you a little history on them first……..Once upon a time long long ago, in a far far away land, Stink Bugs hitched a ride and came over to the United States to make a new home in Eastern Pennsylvania. This was way back in 1998 when they were first discovered. And now in 2014 they have been reported in over 33 states, the Mid-Atlantic region being the most affected. Stink Bugs, aka Brown Marmorated stink bug, native to Japan, China, Taiwan and South Korea, can be almost 3/4 of an inch in size as an adult. They can be brown, gray or dark green and are shaped like a shield. They have alternating light bands on the antennae and dark bands on the thin outer edge of the abdomen. The stink glands are located on the underside of the thorax, between the first and second pair of legs. Typically these bugs only reproduce once per year, but sometimes warm spring and summer conditions can encourage them to reproduce multiple times. During warm months, female stink bugs attach large masses of eggs to the underside of leaves and stems. After hatching, the wingless nymphs go through five immature stages before becoming full-sized, winged adults. Adult stink bugs are most active during the spring as they emerge from their overwintering spots until fall when they seek shelter from the cold. In many cases, their shelter is inside our homes, and this is when we begin to see them on curtains, lampshades, and our furniture!! Okay so now you are asking me WHY DO THEY STINK???? 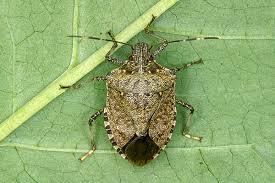 When the stink bug is handled or is frightened it gives off a pungent odor, that is to help them deter predators. So if you squish one you are going to get a whiff of it. Also be careful if you vacuum them up, your vacuum will start to smell. Stink bugs are mostly just a nuisance for home owners but in the agriculture industry they can cause major problems to crops and plants. Stink bugs generally attack apples, peaches, figs, mulberries, citrus fruits , corn, tomatoes, green peppers and persimmons as well as ornamental plants, weeds, soybeans and beans grown for food production. Because they use their piercing and sucking mouth parts to feed on plant juices, they end up damaging the crop permanently. Some farmers have lost their entire crop to Stink Bugs. As an invasive species, they don’t have any natural predators , but research is being done to try to control the problems they cause. WHAT CAN I DO? Prevention is key!! With any kind of pest you will want to try to locate where they are coming into your home. Typically they get in through cracks around window and door trim, or around exhaust fans or lights. You will want to seal these openings with caulk or other materials. It might even be a good idea to call a professional who can identify the target problem areas for you. This not only helps with Stink Bugs it also helps prevent other pests from penetrating your home. If its too late and you already have an infestation it would definitely be a good idea to call a professional. Call Sergio’s Today 248-932-0018 for more information or to schedule an appointment for one of our technicians to inspect your home.